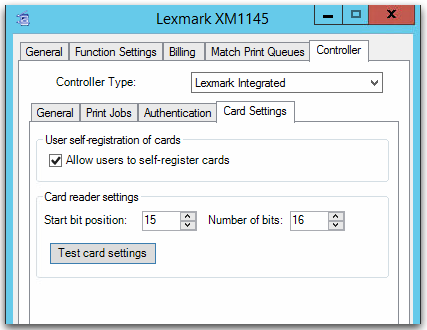 This card reader is supported on all Lexmark devices that support Print Director except for the XM1140 which does not support any card reader. It reads most cards including 125khz HID Prox and ISO EM cards as well as 13.5Mhz HID iClass and Mifare cards. The driver may automatically install when plugged in. 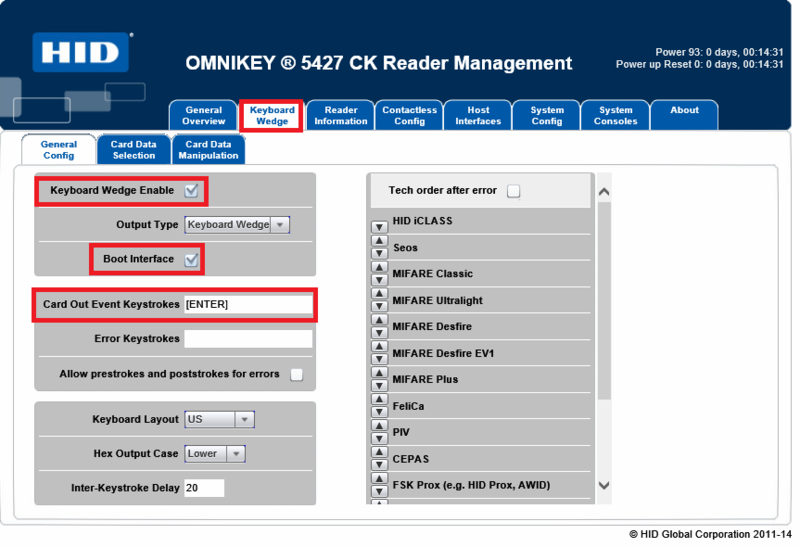 If it does not, go to http://www.hidglobal.com/drivers and download the EEM Driver for the OMNIKEY 5×27. Install the driver and then plug the USB reader in again. 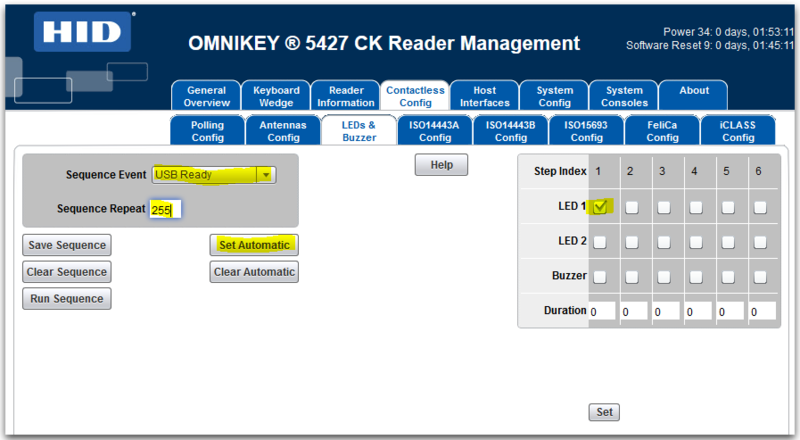 If the driver is correctly installed, it will open the OMNIKEY 5427 Reader Management interface. Tick the Keyboard Wedge Enable checkbox. Ensure Boot Interface is ticked. Ensure the Card Out Event Keystrokes textbox contains [ENTER]. In the Card Type drop down, select your card type. The settings below may differ depending on which number must be used for authentication at your particular site. 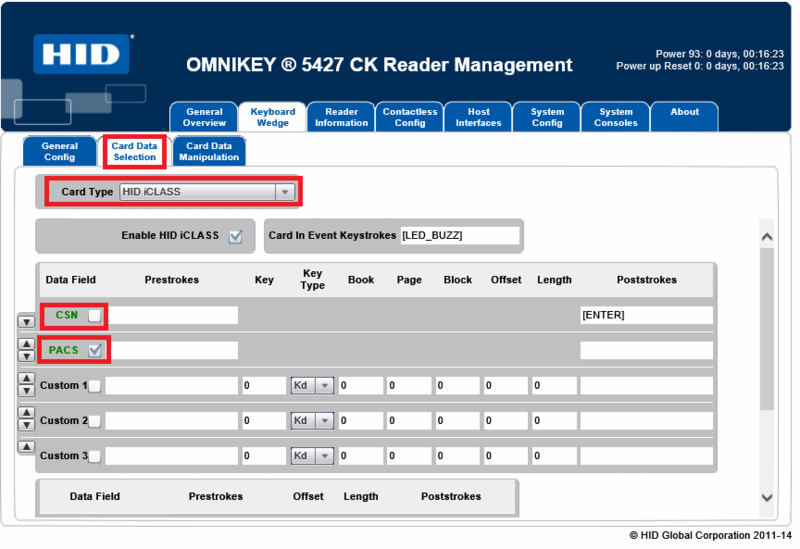 The settings below are an example using an HID iClass card. You can see what data will be sent by opening Notepad and then scanning the card. Edit these settings so that the correct data comes through. It must be a Hex string that ends in a carriage return (e.g. 014001c3). Once the settings have been changed, we can test the output using Notepad. Scan the card. The output should be a hex string followed by a line feed. If the factory default buzzer and LED settings are not to the client’s satisfaction, they can be changed in the Reader Management interface. Under Contactless Config, click LEDs & Buzzer. Edit the settings and test until satisfied.